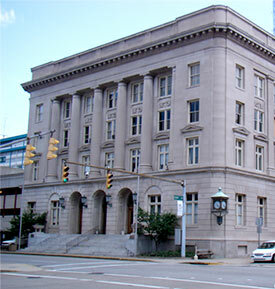 The Charleston Building Commission strives to maintain safe and affordable housing in the City of Charleston and aid in the revitalization of Charleston through the removal of dilapidated structures and by assuring that construction is performed by qualified contractors that meet the adopted building codes. Please Note: All contracting work in the City of Charleston requires a registration and a permit. Permits are to be obtained prior to the start of work. City of Charleston Application Form (enclosed). Current Certificate of Liability Insurance ( City of Charleston must be listed as a certificate holder). A copy of your current State of West Virginia Contractor's License, and if applicable, a copy of your Master Electrician License form the State Fire Marshall Office. Proof of West Virginia Worker's Compensation Coverage (Brickstreet Insurance) or exemption letter from the West Virginia Insurance Commissioners Office. Annual Fee of all registrations is $90.00. Journeyman Plumbers license renewal is $25.00. Master Plumbers renewal is $90.00. Without all of the items listed above, your application will not be processed! NO EXCEPTIONS!! Your company is not registered with the City Collector's Office. If your company is delinquent with the City Collector's Office, or have failed to have filed an up-to-date return. Past Failure to obtain proper permits and required inspections. Expired West Virginia State Contractor License. All contracting work in the City of Charleston will be subjected to a two-percent (2%) Business and Occupation (B & O) Tax and proper registration with the City Collector's Office. All contracting work in the City of Charleston requires a registration and permit. Permits must be obtained prior to the start of a project. A minimum $100.00 extra fee or a fee equal to double the normal fee whichever is greater will be charged if work requiring a building permit is started without first obtaining the permit. Contractors found working without the required permits would be subject to a minimum of a three- (3) month suspension of their City of Charleston license. All required inspections, including the final inspection, must be obtained to remain in good standing. Many permits can be faxed or mailed to the City of Charleston. Forms for that purpose will be sent to contractors upon renewal. The Charleston Building Department is the responsible agency for issuing permits for residential and commercial new construction, remodeling, additions, repairs, maintenance, fences, replacement windows, siding, retaining walls, driveways, accessory structures, sign installation, tanks and pumps, plumbing, electrical, HVAC, and permits for excavations in city right of way. Applications for all permits should be submitted to the Permit Coordinator at 915 Quarrier St Suite 5. Inspection requests for construction must be submitted to (304) 348-6833 allowing a 24- hour notice. The Building Department is also the responsible agency for registering complaints regarding sub-standard housing; work being done without a permit, or any violation of city codes relating to building. In addition, plans must comply with the regulation set forth in Ordinance No. 2924, as amended, ?Zoning Ordinance? of the City of Charleston, and the Building Department ?Administrative Manual?, as amended and reenacted by Charleston City Council on March 1, 2004. RESIDENTIAL: Two (2) copies with full construction details, a site plan indicating the location of the proposed residence on the lot, parking, and the proposed distance from all property lines of all existing and proposed structures, and storm and sanitary sewer details. COMMERCIAL: At least two (3) complete sets of plans and two (2) additional site/drainage plans bearing the signature and seal of a WV registered architect or engineer for new construction and renovations with a construction cost of $50,000.00 or more. Commercial permits under $50,000.00 require the same submissions but do not require a architect/structural engineer stamp. Plans for all construction shall be submitted to the Permit Review Coordinator located at the Building Department at 915 Quarrier St Suite 5. Plans will be reviewed in accordance with Section 202.1 of the Building Department Administrative Manual by all applicable city agencies. Residential reviews within three (3) working days and commercial reviews within ten (10) working days from the date of submittal. Required revisions to submitted plans will begin a new review period. Reviews may be necessary from any or all of the following city departments: Building Department, Fire Department, City Engineer, Traffic Engineer, Sanitary Board, Planning Department. Plan Review Fee is .00075 x Total Cost of Construction for commercial permits over $50,000.00. When reviews are complete a building permit will be issued. One set of approved plans, permits, and any addendum comments from reviewing agencies must be kept on the job site for inspection purposes. All applications for permits must be submitted to the Building Department Plan Coordinator who distributes them to the necessary agencies for review. All agencies, which review the building plans, must inspect the construction for compliance with the requirements noted on the building permit. Final inspection for occupancy will not be issued until all reviewing agencies have signed off on the construction. BUILDING DEPARTMENT : Will inspect all aspects of the construction of buildings and other structures. These inspections include: Footer and foundations, rough-in plumbing, electric, HVAC, framing, ADA accessibility and final inspection for Certificate of Occupancy. Call the Building Department to schedule these inspections at (304) 348-6833. PLANNING DEPARTMENT: Will inspect and certify to the Building Department that all Zoning requirements such as setbacks, parking requirements, landscaping, and other requirements of the zoning ordinance have been satisfied. Call the Planning Department at (304) 348-8105 for answers to specific questions. CHARLESTON FIRE DEPARTMENT: Will inspect the structure for compliance with the requirements of the permit as it relates to the NFPA codes. The Fire Department requires that they be notified one-week prior to the date a final inspection is required. Call the Fire Department at (304) 348-8058 to schedule a final inspection. CHARLESTON CITY ENGINEER: Will inspect the progress of construction at various points to check for compliance with the requirements of the permit and it pertains to storm water drainage facilities and sidewalk construction. Schedule inspections prior to covering up newly installed pipe or prior to pouring concrete by calling the City Engineer at (304) 348-8106. CHARLESTON TRAFFIC ENGINEER: Will inspect the site to check for compliance for requirements regarding field of vision, ingress and egress onto right-of-way, curb cuts, and signage. Call the Traffic Engineer at (304) 348-8108 with specific questions. CHARLESTON SANITARY BOARD - Will inspect sanitary sewer facilities and tap locations for compliance with the provisions of the permit. Location of the sewer tap must be determined prior to starting construction. For inspections during construction of sanitary sewer facilities call (304) 348-6875.